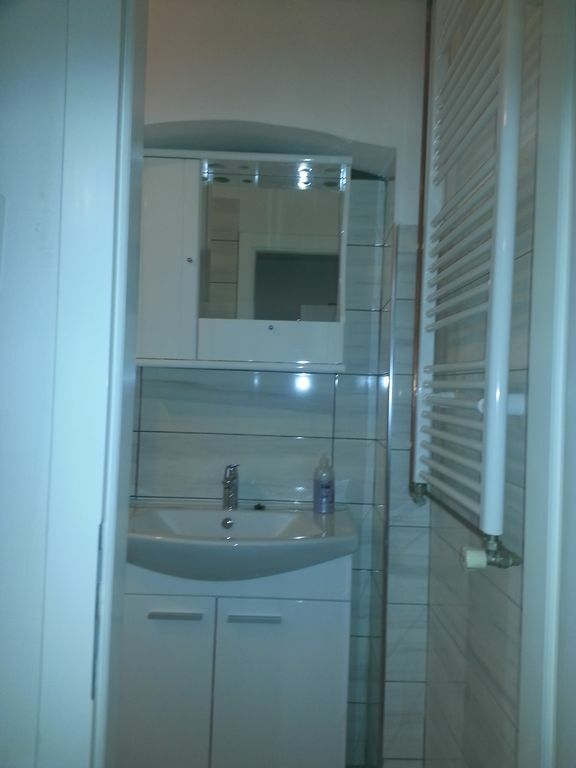 This renovated 30sqm 1 bedroom apartment is private and homely, and sleeps up to 2 people. The bedroom contains a double bed. Located within 2 minutes walk to the city centre Jelacic Square and the Zagreb Cathedral. The apartment contains a kitchen, bathroom has a washing machine, hair dryer, iron and ironing board with toilet .Towels and linen provided. Internet and cable TV also complimentary. Central heating, air conditon, linens provided, towels provided, hair dryer, laundry soap, paper towels, toilet paper. Kitchen: 4 ring stove, microwave, washing machine, cooking utensils, iron & board, refrigerator. Bathroom- toilet and shower. Bedrooms: 1 Bedroom, Sleeps 2. Internet Access: broadband access. Suitability: pets not allowed, long term renters welcome, children welcome, wheelchair inaccessible. Attractions: forests, autumn foliage, botanical garden, churches, cinemas, museums. Leisure Activities: walking. Sports & Adventure Activities: mountaineering, mountain climbing, swimming , tennis. Location for this apartment is great, you are within steps to main square. Entrance to the apartment is scary, especially at night and there is no elevator so carrying your bags up the stairs will be difficult. However apartment is very nice, comfortable and clean. Host was very friendly. There were no unpleasant surprises and I would recommend this apartment to others or even that again some other time. Apartment is in an excellent location close to town center but not in the middle of the high tourist traffic. Is nicely appointed, all you need for cooking, etc. The building where it is located is currently being renovated but since we were there on the weekend was not an issue. The entrance hall is a bit dark but you get used to it. Apartment is fairly quite as is inside and not on the outside street. The washing machine was broken so we ended up hand washing. The bed is very soft and sort of sags in the middle. We ended up filling the indention with pillows. Was clean and owner greeted us upon arrival. Would recommend for the location alone. Thanks for your time to write a rewiew! Our accomodation is a low budget accomodation, small studio for just a two people, so you stayed in the middle of Zagreb for a very small money. Hostels in Zagreb a more expensive :), which means that you have only your bed and shared kitchen, bathroom etc. The bed is a new one, and because some guests find it hard to sleep, we bought another one mattress, so someone likes it hard, someone likes it soft, it is hard to satisfy everyone! And about a washing machine, somebody (I dont know who???) just broken a cover but machine works, you just have to adjust a program with the big round botton. The guy from USA also had a problem with machine, I dont know what kind of washing machine you have in your country?! I am really disappointed that you can recommend our accomodation only for the location. Great apartment. Very central location. We walked to everything, restaurants, shops, outdoor fruit & vegatable market and more. Owner -Jure is super helpful. Beautiful city. My wife and I just finished our 10-day stay in this quaint little apartment. It's a small place and is a great value. The owners were very friendly and welcoming, they worked hard to ensure that we had everything that we needed. Additionally they were very understanding when we had to cut our reservation short. I definitely recommend this place due to the great location (less than 5 minute walk from the main square) and also because it is a nice quiet, charming place to stay and the end of a day of site seeing. Rob and Dunja, thank you very much for this great review, and all the best in the future, Jure and Jasminka. Excellent Location and Excellent Value! Excellent little apartment situated bang in the centre of Zagreb! The owner left me complimentary fruit and soft drinks. The apartment has all the mod cons, plus free wireless internet. Highly recommended! The price was very competitive. An apartment in the centre of Zagreb, only 200 m from the main squire Trg J. Jelacica, one bedroom with double bed (+one bed), use of kitchen and bathroom, dishes, oven, freezer, washing machine, towels, iron, TV, internet... free parking space in the neighbourhood. Zagreb has lot of tourist attractions, his old town, old churches, museums, galleries.... also the Adriatic Sea is only 150 km away..